Zion Market Research has published a new report titled “Graphic Films Market by type of film (opaque, transparent, translucent, and reflective and other films), type of material, (PVC, polypropylene (PP), and polyethylene (PE) and other materials), end use, (automotive, promotion, advertising, and branding, and industrial and other end-use sectors), by Region (North America, Europe, Asia Pacific, Latin America and Middle East and Africa): Global Industry Perspective, Comprehensive Analysis, and Forecast, 2017-2024’’. 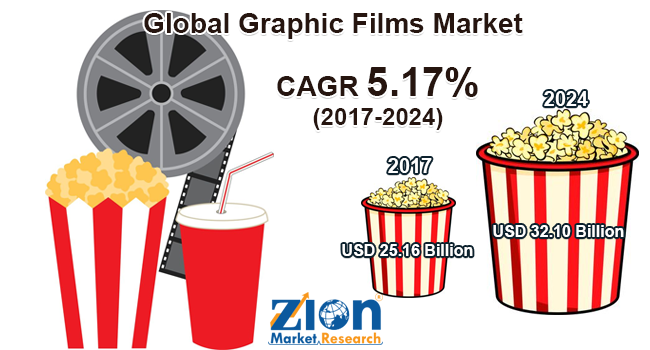 According to the report, global Graphic Films Market was valued at around USD 25.16 Billion in 2017 and is expected to reach approximately USD 32.10 Billion in 2024, growing at a CAGR of slightly above 5.17% between 2017 and 2024. The global graphic films market is expected to witness significant growth over the forecast period on account of increasing demand from advertising & automotive Industry. Graphic Films is widely used as an automotive and advertising industry for making promotional banners and vehicle coater. Graphic films have wild applications such as an anti-graffiti, advertisement, promotional banners, and pamphlets applications. Moreover, graphic films could be progressively used for developing promotional banners and vehicle wraps. When compared to traditional films, graphic films are expected to be the most cost-effective alternative. Rising promotional trends observed in the e-commerce sector boost the demand of graphic films market. However, industry players could find favorable growth in future and also other sectors such as automotive, promotion and branding, retail and construction. While this possibly will help the market to strike with its growth, there are certain other forecasts projected to take shape with the growing application of opaque films. Such types of films can be significantly demanded because of their high durability, excellent printability, lightweight, and ease of use. On the basis of material type, the world graphic films market could be classified into polyvinylchloride (PVC), polypropylene (PP), and polyethylene (PE). PVC segment is expected to stimulate bitumen demand within the forecast period. The demand of polyvinylchloride (PVC) is high due to its properties like excellent printability, high durability, cost-effectiveness, and recyclability. On the basis of end use, the market is bifurcated into, industrial, promotion, branding & advertising and automotive and other end-use sectors. Increasing demand for colorful graphics on modified cars and formula 1 car are growing opportunities for drivers to earn money through advertisements which are anticipated to enhance the market growth over the forecast period. The regional market is further bifurcated into North America, Europe, Asia Pacific, Latin America and the Middle East and Africa. The Asia Pacific accounted for most of the global market share and is expected to grow in light of increasing disposable income, population, rapid urbanization, and income capability of constituent nations like India, China, and Japan. In 2016, International Monetary Fund (IMF) acknowledged that the economy of Asia Pacific grew by more than 5% and is anticipated to grow further during the forecast period, thus graphical film business is lucrative in Asia Pacific market. North America is expected to witness strong growth over the forecast period for graphic films from the automotive industry. Due to exposure of sun for a long duration of time vehicle starts heating resulting in reduces fuel efficiency. Application of graphic films provides with sufficient protection from UV rays.